Liz is the most recent member of the Board but has been involved in animal welfare and spay and neuter programs for many years. She initiated a spay and neuter program on Mustique nearly 23 years ago which has been, and still is, an unprecedented success and has transformed the lives of the animals on that island for the better. Having lived and worked in the Grenadines for over two decades, she has a good understanding of the challenges the VSPCA faces and is committed to making positive change for the animals of SVG through education and spay and neuter. 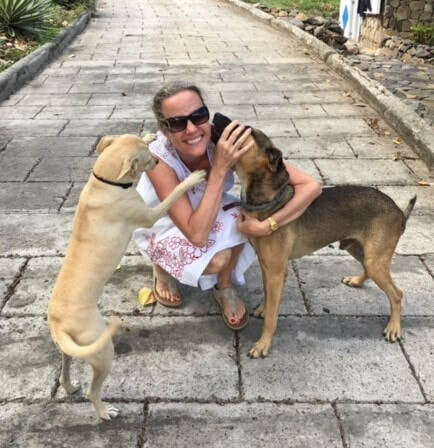 Meeting her first Vincy street dog changed Liz’s life and she now shares her home with some wonderful and amazing Vincy rescue dogs who fill each day with fun and love, plus they make her go for a walk!